This adapter allows to connect a laptop IDE Hard Drive (mini 44pin) directly to a desktop IDE cable (40 pin). 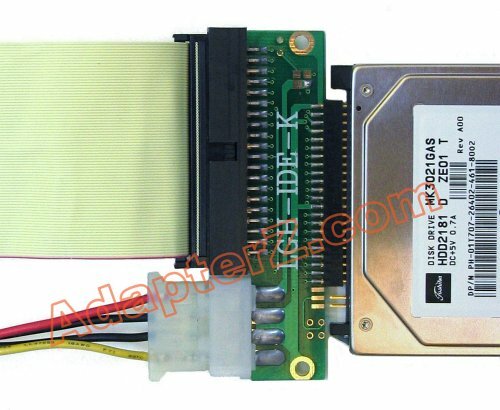 If you just need a permanent laptop drive hookup inside a desktop or a 3.5" slot - please check our adapter kits with rails. 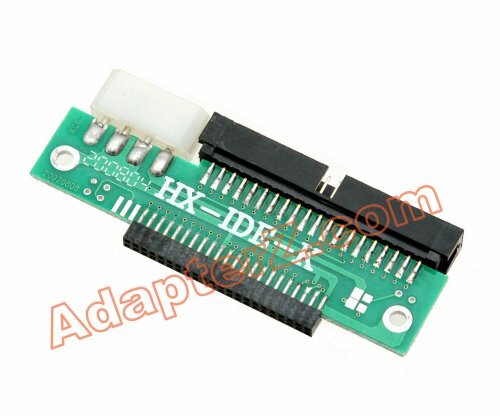 Please note that all of such IDE adapters are deisgned to work directly connected to IDE cable and power supply. They may not work in some removable trays that support "hot swapping". If you need to use this adapter inside a tray, please contact us about our custom modified Genica Trays that work with such adapters. * If laptop drive has XP NTFS partitions; and desktop OS is Win2K - you may experience bluescreens. XP NTFS partitions are more advanced. You may need to upgrade your Win2K host to WinXP to be able to access such XP NTFS partitions. IMPORTANT: You must connect this adapter correctly as shown on the picture above. Incorrect connection will damage the drive. Please follow the diagram for proper connection. Pin 1 must follow through IDE cable to the laptop drive as indicated. Master/Slave pins must never be connected or spanned by the adapter. Just $3.99 and shipping is FREE!!! Plus $1.00 discount on each additional adapter!